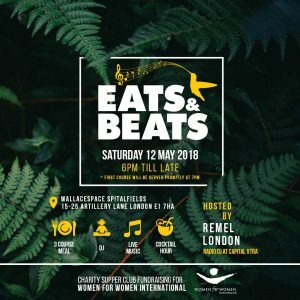 Eats & Beats are back again with more fresh flavours, a rooftop venue and a collection of some of London’s best live performers breaking into the scene. A range of alcoholic and non-alcoholic beverages are also available. Feeding your tastebuds will be Ranette Prime of Love Loretta’s Kitchen (www.lovelorettaskitchen.com), who has been featured by the Evening Standard (2016), sponsored by Sainsbury’s and was the winner of the Guardian’s Recipe Swap 2014. Live entertainment provided by eclectic talent. You won’t want to miss! We’re throwing this fun-filled event to raise money for Women for Women International (www.womenforwomen.org.uk) who help women survivors of war rebuild their lives. « A celebration of Life!